Pastor David Tinker has served as our pastor since April 2012. Beginning in September 2016 Pastor Tinker began serving also as the pastor of Waldeck Evangelical Lutheran Church near Ledbetter, Texas. This is part of a new shared ministry arrangement between MLLC and the Waldeck Church. He has served as a pastor in Lutheran Churches for over 24 years. He has served previous congregations in Ohio, Florida and Indiana. A graduate of Trinity Lutheran Seminary, Columbus, Ohio, and the University of Texas at Austin, he was ordained as a Lutheran Pastor on June 9, 1994. Prior to attending seminary he worked at KUHT – Channel 8 – Houston PBS. Pastor Tinker is married to Deaconess Jennifer Tinker, and they have two sons together, a 14 year old and an infant. In September 2017 she began serving as the Synodically Authorized Minister (SAM) at Emmanuel Lutheran Church in Greenvine (near Burton, Texas, about 10 minutes east of Carmine). Pastor David Tinker grew up in the Spring Branch area of Houston, Texas, and some of his family still live in that community. He finds great joy in seeing people grow as faithful disciples of Jesus Christ. 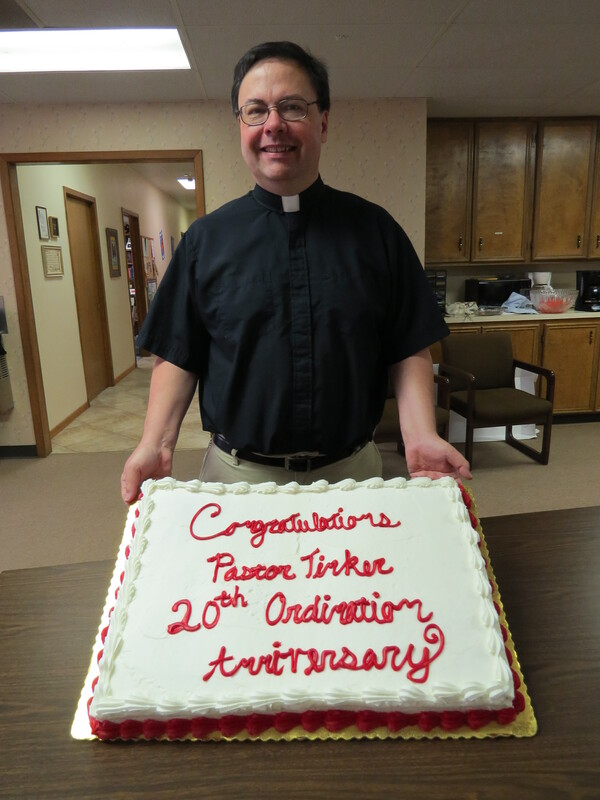 Pastor David Tinker celebrated his 20th Anniversary of Ordination in 2014. The people of MLLC graciously held a reception in honor of this special anniversary. The reception was on Pentecost Sunday, June 8, 2014, which was the closest day to his ordination anniversary. 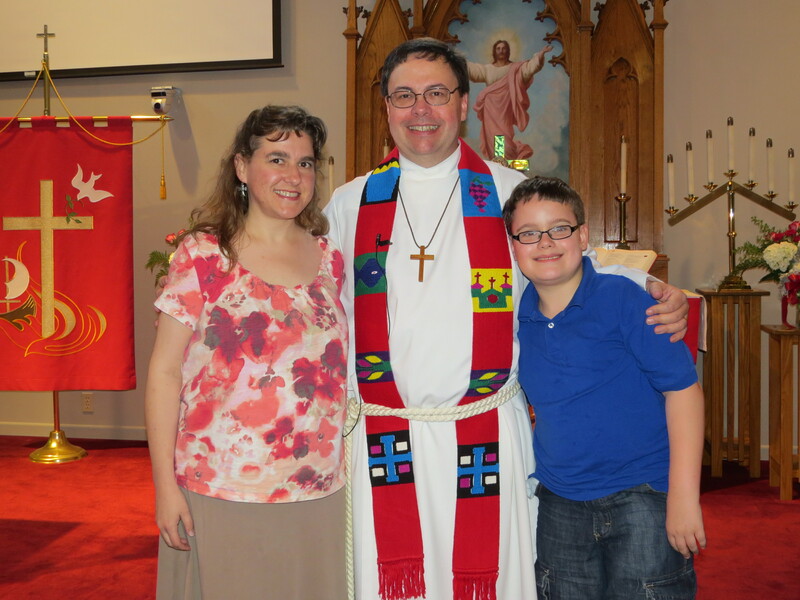 This is Pastor David Tinker with his wife and son on the day of his 20th Anniversary of Ordination in 2014. Here is Pastor David Tinker (left) with Pastor Chris Markert (right) when Pastor Markert was he was visiting MLLC on behalf of the Texas Louisiana Gulf Coast Synod ELCA. This visit was on Sunday, September 17, 2017. Pastor Markert serves as the Mission Catalyst (Director for Evangelical Mission) for our synod. This is Pastor David Tinker (left) with Pastor Pedro Suárez (right), who was, at that time, the Director for Evangelical Mission, Texas-Louisiana Gulf Coast Synod ELCA. This was taken when Pastor Suárez visited MLLC in November 2013. Pastor Suárez was recently elected to serve as the Bishop of the Florida-Bahamas Synod, ELCA. 1994 – Trinity Lutheran Seminary – Columbus, Ohio; M.Div. Hobbies: Movies, Travel, Genealogy, playing with wife and sons. Favorite Bible Verse: “Do not be conformed to this world, but be transformed by the renewing of your minds, so that you may discern what is the will of God–what is good and acceptable and perfect.” – Romans 12:2 (NRSV) – had Pr. Tinker had a “Confirmation Verse” when he was Confirmed in 1980, this would have been his choice. Baptism Date and Location: September 18, 1966 at Lutheran Church of the Holy Spirit in Littleton, Colorado. Confirmation Date and Location: May 18, 1980 at Holy Cross Lutheran Church in Houston, Texas. Ordination Date and Location: June 9, 1994 at Trinity English Lutheran Church in Fort Wayne, Indiana.